SONOSIM SUMMARY: This article from the Journal of Emergency Medicine explores the impact of leg position during femoral central line placement, and specifically how leg positioning affects femoral vein diameter and degree of femoral artery overlap during the procedure. Researchers used ultrasonography to examine variations in femoral vein accessibility for three leg positions: straight, abducted, and abducted with external rotation. The article concludes that an abducted and externally rotated leg significantly increases femoral vein diameter, while optimally reducing femoral artery overlap prior to cannulation. Randall C, Schmeiser E, Fiers E , et al. Ultrasound Investigation of Leg Position to Enhance Femoral Vein Exposure for Cannulation. The Journal of Emergency Medicine. 2014 Aug;47(2):176-181. Background: Femoral venous access is an essential part of patient care in the emergency department (ED). However, current medical literature and texts have not dealt with it much using actual patient anatomy. Objectives: This study aimed to show that manipulation of the lower extremities may alter the anatomy to a more favorable position for cannulation. Methods: Ultrasound examination was conducted on a prospective sample of ED patients to evaluate anatomical variance of the femoral artery and vein overlap as well as the change in femoral vein diameter with leg position. Bilateral measurements of the diameter of the vein were taken at three different leg positions (straight, abduction, and abduction with external rotation). Results: This study enrolled a total of 132 ED patients. Of these, 122 (95%) patients showed some degree of overlap on the left. There was a statistically significant decrease in the percentage of overlap when moving the leg from a straightened position to an abducted position, and an additional decrease when moving the leg into an abducted and externally rotated position. There was also a statistically significant increase in the size of the femoral vein with each of these positions. Conclusions: Up to 95% of people have some degree of overlap of the femoral vein by the femoral artery. 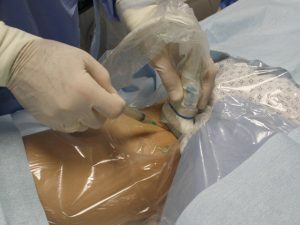 By positioning the leg in an abducted and externally rotated position, the amount of overlap is reduced and the diameter of the vein is increased, maximizing the percentage of the vein available for cannulation.